Dadang Christanto (b.1957) was born in Tegal, a small village in Central Java, Indonesia, into an Indonesian family of chinese descent. He studied painting in Yogyakarta, and was an active member of the arts community. With a diverse body of work that encompasses painting, drawing, sculpture, installation and performance, Christanto has won critical acclaim for his ability to portray and sensitively evoke reflections on universal human suffering and communal grief. He was amongst the first Indonesian artists to enter the international art world in the early 1990s, notably featuring in the first and third Asia-Pacific Triennial of Contemporary Art, Brisbane in 1993 and 1999, as well as the Bienal de Sao Paulo, Brazil, in 1998. He was curated into many other major art events worldwide including Gwangju Biennale, South Korea (2000), and was featured in the Venice Biennale in 2003 and at his home country the Yogyakarta Biennial, Indonesia (2003) and Museum of Contemporary Art, Sydney, (2010). His works are held by the National Gallery of Australia, as well as major collections in Singapore, Japan, Indonesia, and in Europe is at Magdeburg Museum Germany. The National Portrait Gallery of Australia recently honoured him with an exhibition for his role in the development of art in Australia. Throughout his career, Dadang Christanto has produced a body of works that honours the countless victims of political violence and crimes against humanity. The sincerity and rawness of emotion portrayed in his works stem from his personal narrative, which he has subtly woven into every aspect of his art. References to the year 1965 appear again and again. Christanto’s own father was dragged from their home by soldiers, never to be seen or heard from again. As an eight year-old boy, Christanto was heavily affected by his father’s disappearance, thus his art has become inseparable from this tragedy. 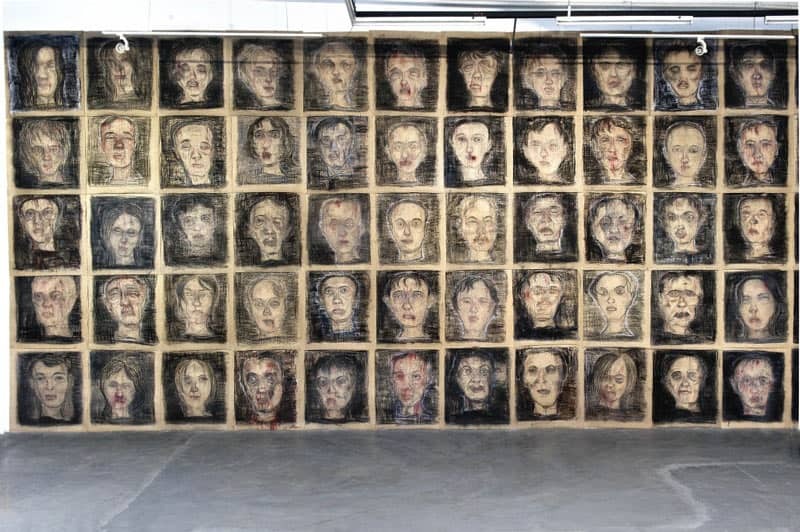 The monumental installation presented at Wei-Ling Contemporary, MISSING (2018), comprises 110 acrylic and charcoal imagined portraits of the 1965 victims. Dadang Christanto’s friend knew a news photographer colleague who somehow, had managed to access and produce photos of those who had been captured and tortured between 1965-1966 in Tegal. The Tegal Province Administration office where they worked at was the chambre noir, where he would develop the photos. Knowing this, Dadang Christanto had always wondered if his father was amongst those in the photos. Unfortunately, the photographer has since passed away. Although Dadang Christanto has not found these photographic archives, his curiosity led him to keep on searching and in so doing, this body of work materialized. The tragedy — a sort of an exposed wound that has never healed — continues to inform the artist’s works, from graphic, stylized paintings with recurrent references to disembodied heads crying tears of blood, to monumental installations with life-size repetitive figures cast in various materials was inspired by relating to loss and disappearance, as well as site-specific installations and performances that act as memorials to victims of violence in all its forms. Across his practice, the act of repetition is crucial. Most remarkable is the recurring repetition of heads and faces, as seen in the installation Slaughter Tunnel (2015), where small portraits of 1965 anonymous faces, each with a streak of red lace emerging from the forehead, line the walls of a cramped and claustrophobic tunnel made out of cardboard, a disposable material, which in this context resembles the way individual lives were treated as meaningless. In another installation, Red Rain, the repetitive portraits are lined up, side by side, on the ceiling, with a red thread of blood dangling from the forehead of each portrait. These small portraits resemble official Indonesian identity cards, which differentiate those of Chinese descent. Blood, a recurring motif, is woven into Christanto’s installations, most notably in In Red (1979), a piece featuring himself wearing a white shirt, seated in front of a white pearl bowl, on a white tablecloth as he splattered and sloshed red beetroot over his face and brushed his teeth with the ‘blood’. The performance alludes to cultural cleansing and subtly suggests how inhumane violence, like the act of brushing your teeth, becomes an everyday reality. Dadang Christanto’s oeuvre engages with collective history and personal trauma. His painting and sculpture are imbued with an aura of silence, precisely referencing the political silence that enveloped the injustices that has shaped his childhood. His unbounded practice transcends its specific historical and political roots and leads to a wider meditation on the nature of violence and unjust death and suffering. Dadang Christanto will debut ‘MISSING’ his first solo exhibition in Kuala Lumpur, Malaysia with Wei-Ling Contemporary from 6 September – 4 November 2018. The exhibition will feature new installations and sculptures and will include a performance.